Dr. Alex Casuccio and his wife Michelle have been patients of Princess Center Dentistry for years. Dr. Lewandowski is a proud supporter of our patient’s small businesses. 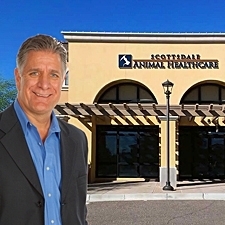 Dr. Casuccio offers over 30 years of companion animal practice experience with advanced skills in dermatology, orthopedic surgery, ophthalmic surgery, internal medicine and much more. As a previous practice owner of over 22 years and a previous Medical Director (supervising, mentoring and coaching 50 doctors at a time), Dr. Casuccio offers top notch medical expertise along with the friendly, personal approach that all clients want. In his spare time, Dr. Casuccio is an avid horseback trail rider and is also a commercial pilot in both sea and land airplanes. Please visit http://www.scottsdaleanimalhealthcare.com for more information.